Happy almost Fourth of July everyone! We are sooo excited about summer over here! It is in full swing and full of fresh fruits and vegetables. In my previous posts I mentioned loving this time of year because it enables my little Kirina (age 3) and I to visit farms and pick all sorts of yummies, from berries to peas to melons. We discovered this concoction after one of our hot afternoons outside: Watermelon Agua Fresca. Sooo good! Agua fresca in Spanish simply means “juice made with fresh water.” What a great way to beat the heat. Also a great way to introduce some herbs. Mint has been the herb of the week over here…it just sings summer! Kirina enjoys picking it and I enjoy muddling it into a mohito (did I mention babies make us want to drink? 🙂 ). This agua fresca recipe is barely even a recipe and can be worked into any BBQ party you are having this weekend. Um, yes, that is it. I wish I had a picture. It all happened so fast I didn’t have time to grab a camera. 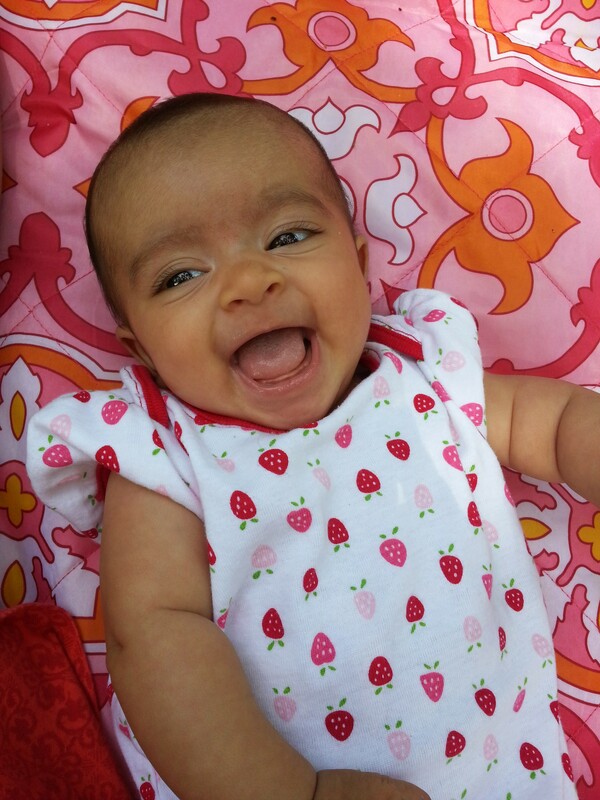 I’ll leave you with a summery picture of my almost four-month-old instead. From our highchair to yours, bon appetit! « From farm to highchair!